Rhythmicon from Thomas Patteson on Vimeo. The Russian inventor Leon Theremin is best known for the eponymous instrument he created around 1919. 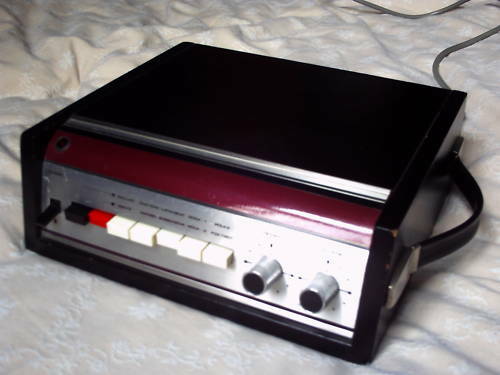 But another invention of Theremin's is perhaps even more prophetic of later developments in electronic music: the Rhythmicon, produced in 1931 at the behest of the American composer Henry Cowell. This device allowed for the real-time generation of complex rhythmic patterns thought to be unperformable by humans. Each successive note on the keyboard triggered a division of the basic beat in whole number ratios: the second key beating twice for each basic beat, the third key beating three times, and so on. This video shows the Russian scholar Andrey Smirnov demonstrating the how the Rhythmicon is played. The device shown in the video is likely the later version, developed in the 1960s and now housed in the Theremin Center in Moscow." 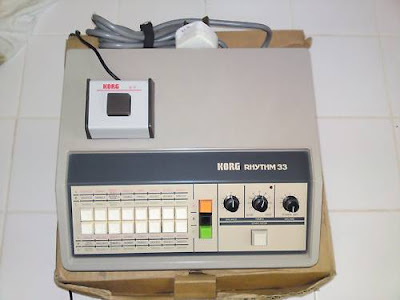 KORG Rhythm 33 with footswitch & orig box...for sale! Hey this must be a day of amazing vintage classic's....yet another perfect machine for sale at good ole ebay and it looks in great condition too!...here's the sellers info! KORG KR33 all analogue drum machine in very good condition with original footswitch and box (though the box is a bit out of shape!) This thing is over 30 years old and either hasnt been taken out of the box much or has been looked after very well. Either way, its good news for you! 48 DIFFERENT RHYTHMS…ADJUSTABLE TEMPO AND BALANCE BETWEEN THE LOW AND THE HIGH. VOLUME CONTROL.SEPERATE LOW AND HIGH QUARTER INCH OUTPUTS. QUARTER INCH TRIGGER OUT AND FOOTSWITCH. NOT PROGRAMMABLE. ROLAND TR66 vintage classic....for sale! This auction included one vintage Roland TR-66. Nice condition for the age! International bidders please consult for option to shipping cost. KEIO Korg MINI POPS JUNIOR Vintage Analog 70s...for sale! Now this is a serious beauty!...if this doesn't make you totally drool & want want want!! !....you aint the druMachineFreak I took you for!.....here's some seller info on this perfect classic....jeeeeezuz I want it NOW! KEIO MINIPOPS JUNIOR VINTAGE 1970s RHYTHM MACHINE! The baby of the MiniPops range, with 10 preset rhythms to hand, although hybrids can be created by pressing 2 buttons at once. From early-mid 70s, manufactured by Keio Electronics, now better known as Korg. Totally distinctive MiniPops sounds, with plenty of woodblock & snare on these Junior models. This version has a painted black finish (original) with carry handle on the side. Jacks for Output & Start/ Stop. come hands up who doesn't want one of these glitch'tastic pieces of art! !.....nice work!! POSTED BY ALEX13211 ON YOUTUBE! ANDROID Music Electrum Drum Machine, Sampler, Reloop Sequencer! Google’s Android platform has gotten only a fraction of the attention for music making that iPhone OS and iPad have, but that doesn’t mean the OS doesn’t have some advantages of its own. Thanks to being an open OS, it’s also easier to install custom OSes, and repurpose older devices and build cheap embedded computers on a platform like BeagleBoard. The remaining challenge: convince Google that beefing up real-time audio hardware access is important. So, with Google’s own I/O conference this week and me in Berlin next week during DroidCon, now seems like the perfect time to talk about handheld music on the platform. Why should you care? Hint: having access to the SD card – and the ability to load and save MIDI and audio files to it – means you can do some damage. In fact, you might not even need a computer for loading samples and sequences. Photo (CC-BY-SA) James Nash. Electrum Drum Machine is a full featured 6 sound drum machine with a traditional 16 slot pattern sequencer, along with a step sequencer to sequence patterns into a song. Up to 32 patterns can be created. Each sound can have its pitch, volume, start and end points modified. The drum machine also has a shuffle feature, as well as multitouch pads for playing. Supports WAV/MIDI export. CHECK OUT ORIGINAL POST & MORE INFO AT VJ HEAVEN! CHECK OUT MORE INFO AT NIKO TWENTY! Ok then so we've all got our iPads!?.... 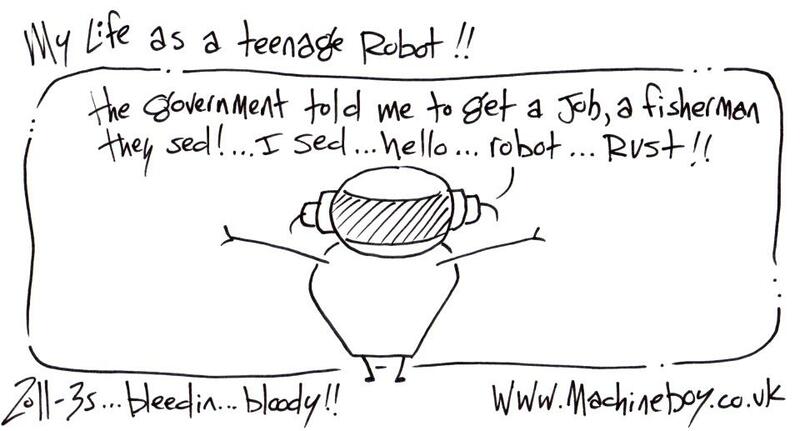 ;-)....now this is just what we all need!! no really it is! !...this looks as cooooooool as hell!!.....awesome!! Demo of the FunkBox Drum Machine iOS app from Synthetic Bits. FunkBox emulates the look and feel of a vintage drum machine, using classic beatbox sounds including the TR-808, TR-909 and Maestro Rhythm King MRK-2. It works on the iPhone, iPod Touch and now the iPad. FunkBox is a universal app, so you only need to buy it once and you can use it on any of those devices. This demo is of the iPad version, especially designed for the iPad to be fun and super easy to use. Available now in the Apple app store. CLICK HERE TO CHECK IT OUT AT THE APPLE STORE! Cyborg studio's have a great page offering free downloads (pdf's) of a complete shedload of Drum Machine manuals! !....all the links I checked are 'unbroken'...so if you need a manual check here first...nice one!!! 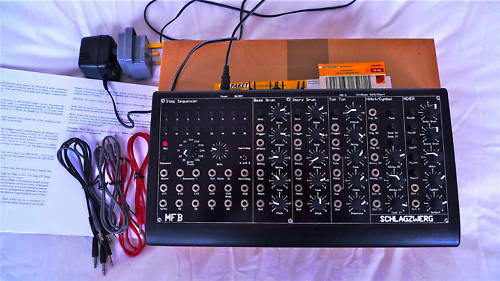 I offer here for sale an MFB Schlagzwerg semi-modular analogue drum machine and sequencer. Its unusual quality is the semi-modular features which allow a different range of creative possibilities to the standard analogue drum machine... the sequencer controls not just the rhythm loop but also can control the timbral characteristics of the different drum modules. I was hoping to keep hold of this because it really seems to offer something very unusual. It’s also a rather rare beast - I had to purchase mine directly from MFB in Berlin. However, I’ve reluctantly concluded that if I don’t pay my electricity bill etc. soon then not even my computer will work!!! Plus, my musical direction doesn’t have much use for drums at all. I have no other drum machines and am not planning on buying any. 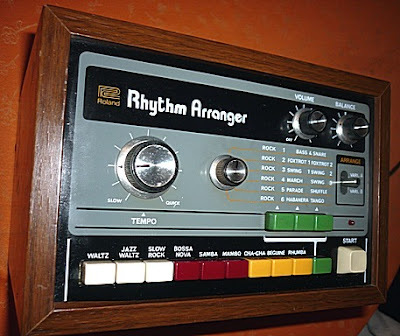 Which means I’m no expert at saying if this drum machine sounds better or worse than any other; I simply don’t know what ‘better’ means in this context and many people are very, very fussy when it comes to drum sounds. Electric bills notwithstanding, it’s a hardly-tried-yet piece of kit with all original packaging and components so I’m looking for a decent price relative to its original purchase price (€680 = £570). It’s a very reluctant sale, having earlier sold all my other hardware with the exception of a Mono Evolver, which is more immediately on-target with my own directions. The lowest - new - price I’ve found today is £527 so I’ll accept £450 - incl. p&p - for mine. This is a very rare chance to purchase one of these at a second-hand price. The PSU is for continental sockets although of course I’ll throw in a UK mains adaptor plug. It has a MIDI in socket, thus allowing the sequences to be started, stopped and synchronised with other MIDI devices and - of course - a computer DAW. DRUM MACHINE from Old Farfisa Organ...for sale! 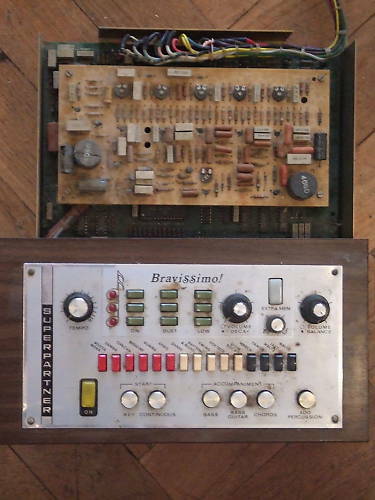 Unusual Bravissimo drum machine from old Farfisa organ. Has a function for "Extra Men"! This item is quite heavy. Good condition SPD-8, modified to be easier to play with hands. It can still be played with sticks. WELSON Super-Matic S12 'PRE ROLAND'...for sale! Another historic classic....shiny metal...a bit of wood grain!...this is how machine's should be made!...this is not just a drum machine (rythm machine! )...its a piece of 'ART'...furniture....and a very cheap starting price....WOW! 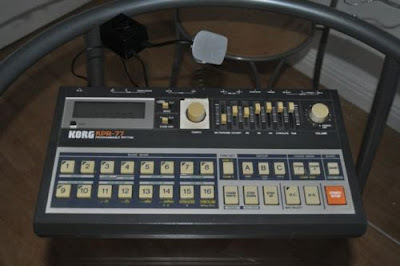 THIS THING IS SERIOUSLY RETRO, NOT EVEN SURE WHEN THEY WERE PRODUCED AS INFORMATION ON THEM IS LIMITED, EITHER WAY ITS SAFE TO SAY ITS PRE 1980'S TECHNOLOGY SO PROBABLY ANALOGUE AND PRE-DATE'S MOST OTHER COMMERCIAL DRUM MACHINES, SO IT DOESN'T HAVE AS MANY PARAMETERS BUT THEN YOU AREN'T LOOKING FOR AN 808 ARE YOU? ONE OF THE OLDEST EXAMPLES OF AN ELECTRIC DRUM MACHINE I'VE COME ACROSS. "12 different rythms: Waltz, Tango, Western, March, Samba, Mambo, Bossa Nova, Swing, Shake, Slow Rock, Rythm and Blues and Metronome. It has a potentiometer to control the volume and another to control the tempo. It also has a tone and impedance control potentiometers in the back. 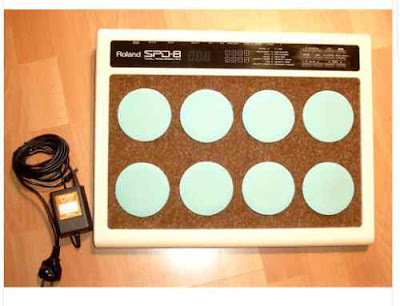 It has 4 push buttons that allow you to play 4 different types of percussions at any time (Rolldrum, Clave, Tom1 y Tom2). It has an ON/OFF and a START/STOP switches. The last one can also be controlled using a pedal that is connected through a Jack socket in the back (I used the same pedal that came with my guitar amp to change the channel). It also has a light that turns on when you turn on the supermatic and that flashes with the frequency of the rhythm (set by the tempo potentiometer). " "Rare vintage drum machine which works, but in a way that doesn't let you forget its extreme age. ...the lovingly-made cabinet adds to the effect of being very very old for this technology. Sounds aren't exactly vibrant or accurate, but you don't buy one of these for that. 'Shake' is a nicely-dated name for a rhythm; and the four buttons on top are fun, for adding sounds manually. Lo-fi, lo-tech, but good fun. Nice power / bar light. One of very few drum machines to have an impedance matching control on the back..."
ALL IN ALL THIS IS AN EXCELLENT COLLECTORS PIECE AND IS IN EXCELLENT PHYSICAL CONDITION, NO CRACKS TO THE WOOD AND ONLY A SLIGHT SCRATCH TO THE TOP OF IT. FORMANTA UDS Vintage Analog Drum Module + Beatbox...for sale! 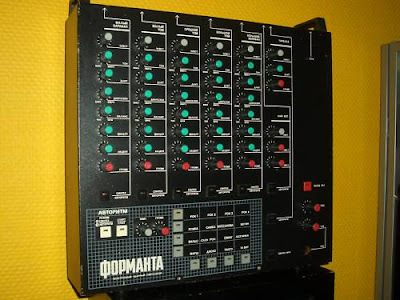 FORMANTA UDS - SOVIET ANALOG 7 channell DRUM SYNTH with DRUMMACHINE. RARE EXTREMELY POWERFUL ANALOG ELECTRONIC DRUM MODULE. • FORMANTA UDS is 7-channel analogue drum synthesizer with built-in beatbox with 16 patterns. 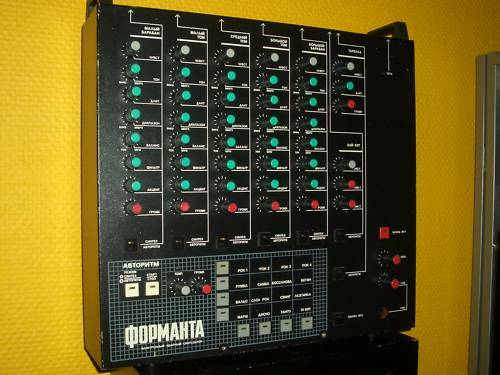 • This auction drum synth was made in May 1986 in Soviet military radio factory FORMANTA, Kachkanar city. • 5 independent channels of drum sound synthesis. • Additional channels for cymbal and hi-hat synth sounds. • Controls for each channel: input signal sensitivity, tone pitch, pitch envelope time, pitch modulation, noise/tone balance, filter's cutoff for noise, accent ,volume. • Oscillators: VCO + Noise, Oscillators Waves: sawtooth, square. • Onboard drummachine with 16 preset drum patterns. You can switch every drum sound channel to its preset sound or switch it in "synthesis" mode and then control channel's parameters by 8 knobs. • The beatbox and the synthesizer are independent modules so they can work at the same time freely. And you can tweak the generators of the beatbox patterns. • Connectors on on the rear panel - 7 AUDIO IN for each drum channel, Mono AUDIO out, Left /Right OUT. Pedal Inputs. All connectors are on standard 1/4 '' jack. • Power Supply: 2 pin euro 220/240V. • No MIDI. You can trigger it from any audio output - synthesizer, drum machine or virtual instrument from analog output of Your soundcard. • This drum module looks very good, there are some really small scratches on metal body, but overall cosmetic condition is very clean. It is in excellent working condition and is fully checked before this auction. All pots were cleared and checked before auction and are without noise on moving. • This drum synth sounds really powerful. It is an armoured antitank piece of gear and the sound it produces is very unique, but it might have been based on some earlier western drum synth like Tama and TR909! • Package including: Formanta UDS unit, Russian to English panel translation diagram (jpg format) and power cable. DruMachineBoy's official favourite EVER drum machine...a simple little thing!...with great usuable groovy sounds!...if you're an electronic musician...the sounds are just incredible....sadly over the last few years these machine's have been selling for crazy high prices and seemingly still are!...so if you're cool paying a couple of hundred for this amazing little machine, theres a few currently on ebay!....sweeeeet! Hi I am selling the classic Boss DR-55 drum machine. This drum machine does work but does not have the original manual or box. It is in pretty good condition with only a few surface blemishes from the age of this machine. The DR-55 Dr. 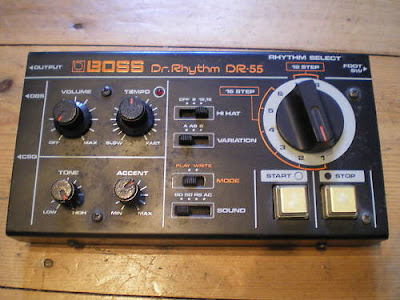 Rhythm was released in 1980 and was one of the first step-write-style drum machines, and it was the first rhythm machine in BOSS' successful Dr. Rhythm Series. It was small, inexpensive and easy to use - perfect for musicians at any level. Incredibly basic controls and sounds made this drum machine an instant hit among guitarists and other musicians looking for drum accompaniment to practice along with and even record into their home recordings. The DR-55 could store up to six 16-step drum patterns plus an additional two 12-step patterns. The 12-step patterns allowed for 3/4 and 6/8 rhythms. A variation switch allowed you to, on-the-fly, alter the pattern playing. There were only four sounds in the DR-55 which included Snare Drum, Kick Drum, Rim Shot and Hi-Hat. 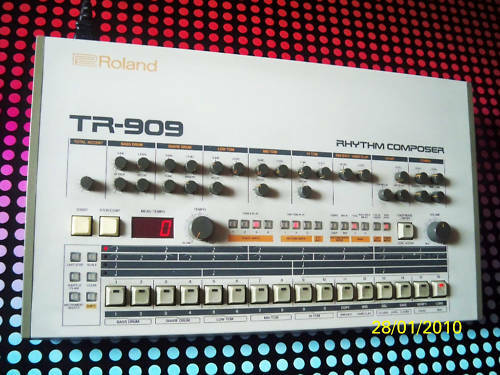 The sounds are comparable to Roland's CR-series of rhythm machines as well as some of Roland's cheaper TR-machines (like the TR-505, TR-606). You can globally adjust the Volume, Tempo, Tone and Accent for the drum sounds. 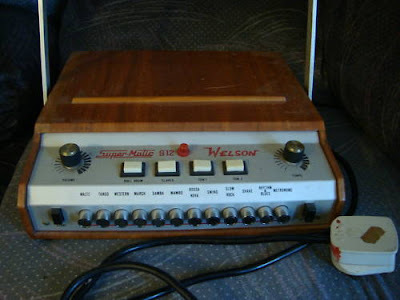 Step-Mode programming was accomplished in a fairly basic manner: Switch the DR-55 into Write Mode and select a sound from the Sound switch, and use the Start button to place the sound and the Stop button to step through the 16 (or 12) beat pattern. Only Kick, Snare, Rim Shot and Accent could be placed in a pattern in step mode--the Hi-Hats could only be programmed as either Off, 8ths, 12ths or 16ths via the Hi-Hat switch. Primitive programming for sure, but very simple and effective. RHYTHM Ace Tone FR2L Analogue...classic...for sale! 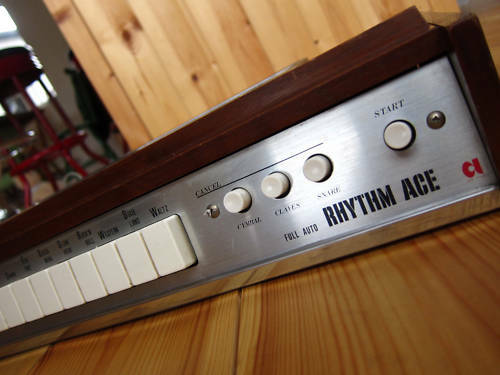 This Is a 1970 Vintage Ace Tone Rhythm Ace Drum Machine . Ace Tone later became Roland. This Example is in exellent condition considering its 40 years old. It works perfectly sounds awesome! TERMS OF SALE ARE ; SOLD AS SEEN , SOLD AS IS . NO RETURNS. I'M HAPPY TO DEMONSTRATE IT FULLY WORKING IF YOU LIKE TO COME AND TEST IT BEFORE YOU BUY :) POSSIBLE PART EXCHANGE ! IF YOU HAVE SOME INTERESTING SYNTH OR SOME OTHER STUDIO TOYS - I MIGHT BE INTERESTED IN PART EXCHANGE. 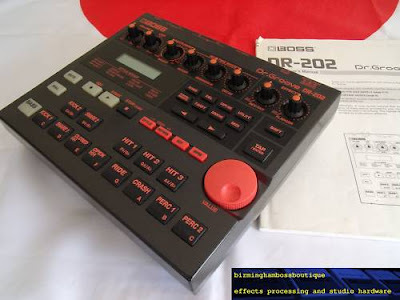 BOSS Dr Groove DR202 + Manual....for sale! Boss drum machine targeted at electronic musicians and loaded with classic Roland drum sounds like TR-909, TR-808, lofi drum samples, even TB-303 sounds! Item is unboxed but with original manual, cosmetically the unit is in grade C/D condition, has been well used and there is a fair bit of wear to the outer case and screen, some of the pads are not quite as responsive as I would like also hence the price, but all are functional and the unit is in good working order aside from this. Please note no power supply is included with this listing, this listing is for the machine only- this is designed for the Boss PSA adaptor or alternatively can be run from 6xAA batteries. Check my other items for loads more Boss gear!! Note that this product is no longer in production. Similar capabilities can be found in the DR-670/770 Dr. Rhythm. 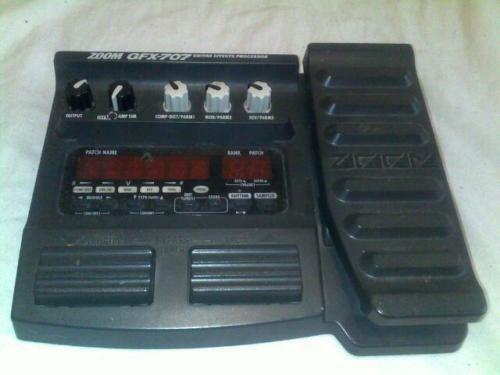 ZOOM GFX707 multi effects pedal + drum machine...for sale! This is a weird one....if a bit of multi effex for yer geetar is where its at..you get a built in drum machine too! !.....god knows what it sounds like! but hey here's some info from the seller!....good luck!! SELLER INFO: Zoom GFX-707 Multi effects pedal , Comes with power supply. Small chip in the screen (does not impair vision and does not effect usage in anyway). Perfect working order. Mike Walters has just let us know about his latest 'musical thang' he's got going on...is it a tascam four track or is it a drum machine?....well apparently its a bit of both!....so here's the deal its a drum machine based on the guts of an old tascam 4 track recorder...anyways just to say over here at DruMachineBoy towers we are suitably impressed bigstyleee...because its got a kinda 70's 80's esque paintjob its got lotsa bright red analog buttons, its got little flashing lights and it plays 808 sounds whats not to LOVE!! !.....so go and check out the genius of Mike Walters 'Drumssette'....WICKED!...there's lotsa technical info and lots more video's & photo's. CHECK OUT MIKE WALTERS WEBSITE FOR MORE INFO! 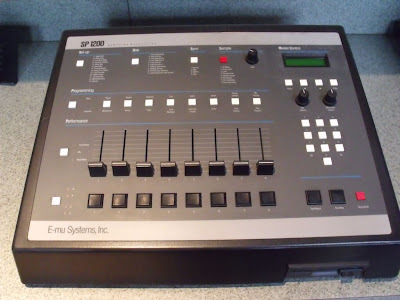 A MONSTER e-mu sp1200 reissue for sale! E-mu SP-1200 Black re-issue for sale. Serial # 2950387. 100% functional and in great condition. Minimal scratching and nothing major. She's pretty! First things first, sample anything into this thing and it comes out the other side sounding siiiiiiiick. I send stuff to the SP, sample it and then record it from the SP to my computer and I get that classic SP-1200 grit. If you don't know. Google it. Or listen to pretty much any hip hop album from the early/mid 90's. It's legendary! It has a sequencer too which is cool (make sure to double time the bpm for optimal swing) but the machine is by and large known for its famous ring mod sound you get when sampling it. 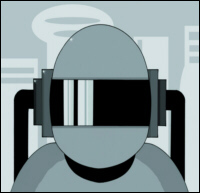 (Listen to the intro of Daft Punk's "One More Time"). HEY! 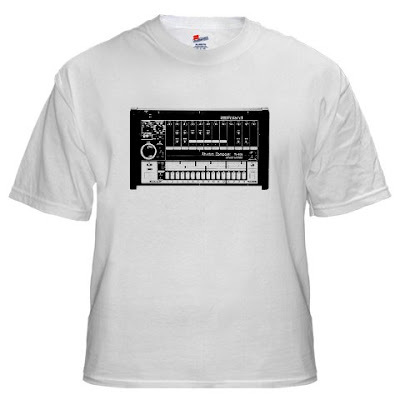 its a tshirt...no its a drum machine...no its a drum machine t shirt! phew! 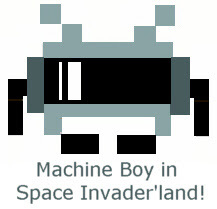 CHECK OUT DRUM MACHINE T SHIRTS AT CAFEPRESS! VINTAGE ANALOG Companion 4 in the floor THEREMIN percussion combo! Dual-Action 60's Analog Drum Madness! 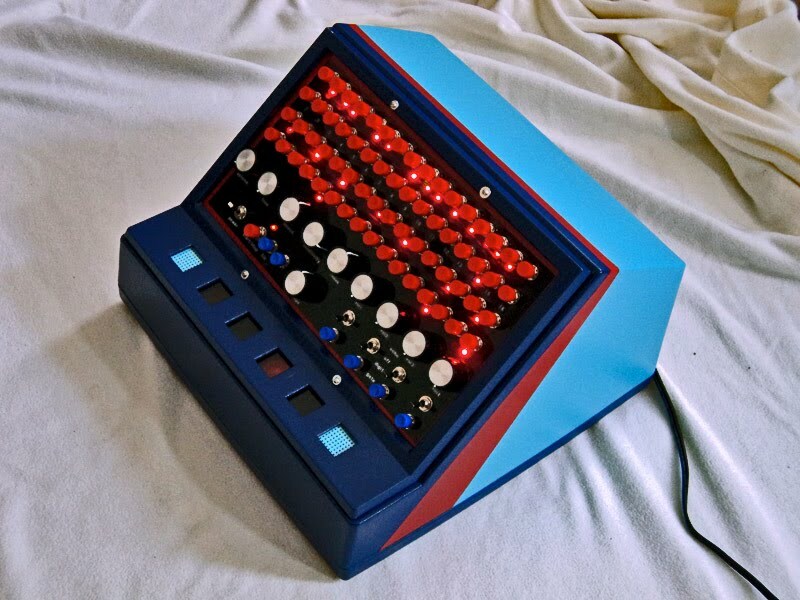 Originlly put out by Companion a Japanese company this one's been modded to be a super rare, way-out & wild, analog drum machine with a photocell theremin bent in for good measure. It's played manually by hand or foot and it has some fat analog sounds that you'll hear on the demo below. The details are beautiful with chrome & rubber pedals, rainbow control panel and simulated wood veneer covering. Decay times for each drum are easily tweaked inside via the potentiometers, but are set nicely for optimal freak-out levels. There's also individual volume controls for each sound, a speed adjustment for the snare rolls & theremin, a switch to go from snare to theremin and a 1/4" output. Please note - this is the last one available to the public ever, the other 2 are owned by members of Depeche Mode and The Beastie Boys. This is one of my favourite vintage drumboxes. The Sequential (Circuits) TOM is a great American drum machine - similar to the SCI Drumtraks. Also it could be the little brother of the Studio 440. It has a decent MIDI implementation and understands MIDI SysEx. The TOM's memory contains 8 samples; inserting a sound cartridge, you can have 7 additional samples. A shame, that it does not have individual outputs. The crispy 8-bit samples sound great. The built in sequencer has a "tight" groove, it grooves like hell! I don't mean the "shuffle" function (there is none). It has a very own timing, which makes you move... (like you can hear in the video). In this video you will hear the following cartridges: "basic percussion", "special effects", "latin percussion" and "contemporary".